Iván left Cuba with his family on a hot afternoon in August 1961 when he was 16 years old. Twenty-one people jammed onto a 92-foot boat, fully aware that they could be shot or spend 20 years in prison if caught. Or they could drown if their boat drifted into the raging tropical storm sweeping across the Caribbean at the very moment of their departure….only minutes to gather your things. What would you grab to remind you of the life you left behind? A doll? A toy? A ring? Iván reached for two 12-inch long-playing records, one by Luis Bravo and the other by Ramon Veloz. To take records is both an amazing and fabulous choice. It’s a simultaneous act of remembrance and revenge. 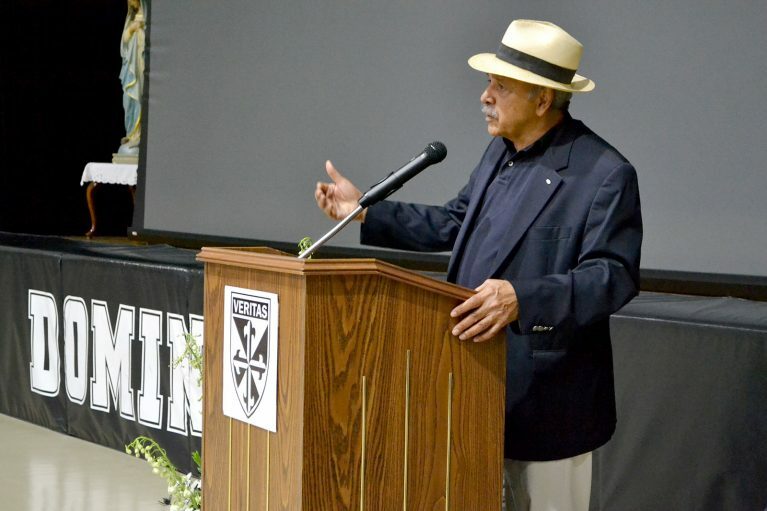 Addressing the student assembly, renowned Cuban-American author, filmmaker, and playwright Iván Acosta shared his career path and life experiences as an immigrant from Cuba. 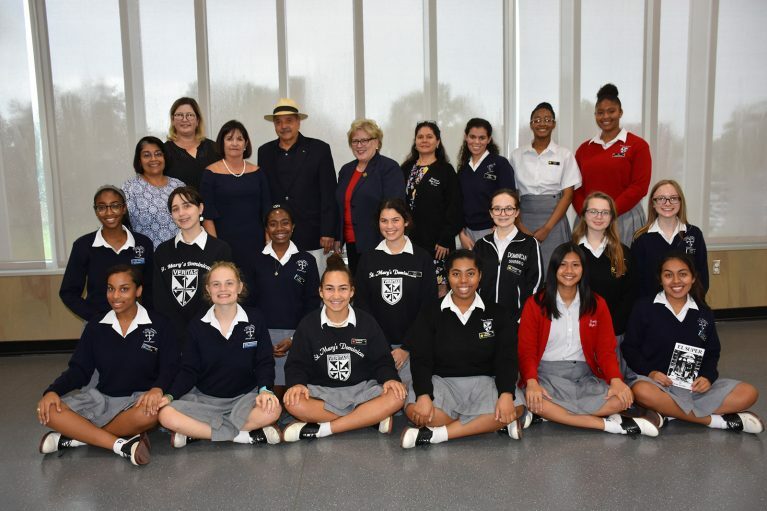 His St. Mary’s Dominican High School visit was among several New Orleans events co-sponsored by the New Orleans Hispanic Heritage Foundation (NOHHF) and Tulane University’s Cuban and Caribbean Studies Institute in celebration of National Hispanic Heritage Month (September 15- October 15). Dominican was among the collaborators with NOHFF and Tulane. Introducing Mr. Acosta, Dominican alumna and NOHHF Board of Directors member Mrs. Maria Leon-Vallejo (’76) who also serves as the NOHHF Ambassador for Dominican, noted that his latest endeavor combines two of his passions – Cuba and music. His 2017 memoir, With a Cuban Song in the Heart/Con Una Canción Cubana en el Corazón, is a personal history recounted through the author’s extensive music collection of over 6,000 vinyl records – many of these line the walls of his Manhattan apartment. The book features artwork from 280 album covers in his private collection. It weaves a rich narrative combining real life experiences from his childhood in Santiago, Cuba along with local lore and historical references. 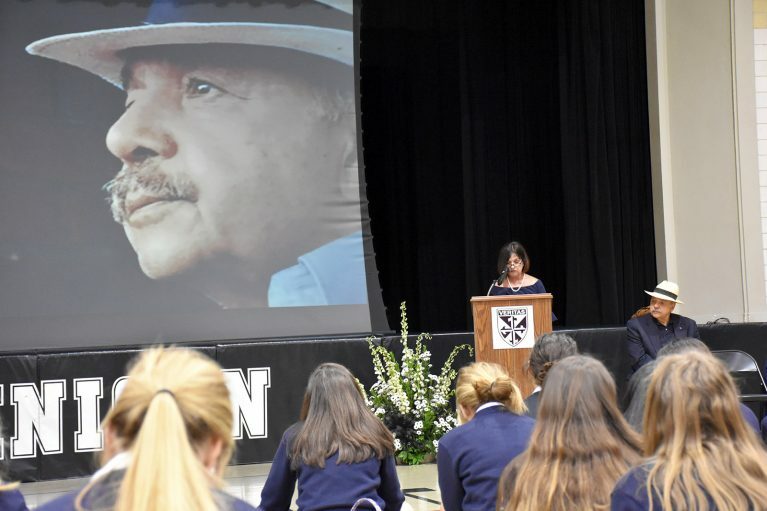 “In this book, music both informs and interacts with memory as the author takes us on a journey of his life from his youth in Santiago, Cuba to the present,” noted Mrs. Leon-Vallejo. Mr. Acosta shared that his early fascination with films started at age five, using his mother’s thread spools to view the backdrop of a postcard for his imagined film. Born in Los Hoyos, a neighborhood in the eastern province of Santiago de Cuba, Mr. Acosta has dedicated his life to preserving and fostering Cuban and Latino culture. Since leaving Cuba he has lived in New York City and was founding member and long-time director of the Centro Cultural Cubano. In 1989 he created Latin Jazz, USA, which promotes Cuban and Latin Jazz music concerts throughout the United States. He studied film at New York University and theater with Alejandro Jodorowky of The Living Theater and New York Theater of the Americas. He is a founding member of the Cuban Cultural Center of New York. His critically acclaimed play, El Súper (1977) is a canonical text of Cuban-American and Latino drama. In it, Mr. Acosta poetically portrays the tragedy and comedy of the Cuban exile experience through a family’s struggle to adapt to life in New York City. In 1979, the play was adapted to film, winning more than 20 awards in international film festivals, and hailed as the most important and emblematic film of Cuban exile. A film clip was part of his Dominican presentation. Another play, Cuba, Punto X (2012), won several Ace Latin Awards, including the Hola Award for Excellence in Theater for best director in 2013. Throughout a career that spans more than four decades, Acosta has written 15 theatrical plays and seven screenplays. His other films, Amigos, Candido Hands of Fire, How to Create a Rumba, and Rosa and the Executioner of the Fiend, have been shown at several national and international film festivals. He is currently securing funding for Guantánamo, an ambitious film project 30 years in the making, that will be filmed in both the US and Cuba. Following his talk, Mr. Acosta and Mrs. Leon-Vallejo joined members of the school’s Multicultural Club, Spanish Club, and the Students for Human Dignity and Diversity in Action Organization for lunch and continued discussion about his work.